February 2 was Groundhog Day. The day plays host to a somewhat bizarre ritual in the United States and Canada in which people haul a rodent out of its burrow and hold it up to see if it sees its shadow. 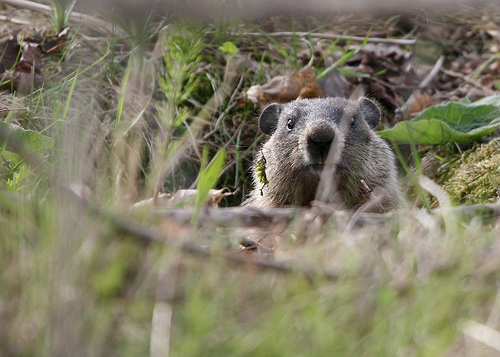 Tradition holds that if the groundhog sees its shadow, we get to suffer through six more weeks of winter. No shadow? Early Spring! On Saturday, Punxsutawney Phil, the most famous of the groundhog prognosticators, predicted early spring. Woot! But it turns out Phil is right only about 40 percent of the time. Sound familiar, Phil? And in Germany, they believed that a badger (some sources say a hedgehog, and I suppose one must use whatever small animal is most readily available) seeing its shadow would bring more winter. This brings us back to Punxsutawney. In the 1800s Germans immigrated to the United States and many settled in Pennsylvania (becoming known as Pennsylvania Dutch or Pennsylvania German for the dialect they spoke), bringing their traditions with them. In Punxsutawney, Pennsylvania, however, people were more likely to eat Phil’s ancestors than seek weather advice from them—at least until a local newspaper editor got involved. Clymer Freas was the editor of the Punxsutawney Spirit. He endowed Phil with weather wisdom, created Phil’s abode in Gobbler’s Knob, and promoted the first official ceremony, February 2, 1887, in the paper. Today, thousands (an estimated 30,000 on Saturday) descend on Punxsutawney for the festivities. All those town visitors bring in tourism dollars. Other areas, not to be out done, decided their own groundhogs (also known as woodchucks or marmots) were equal to the task of weather prophecy. Chattanooga Chuck, Stormy Marmot, Balzac Billy, and General Beauregard Lee are among the soothsaying Sciuridae (yes, groundhogs are members of the squirrel family) that are looking to stage a coup and reign in Phil’s stead as king of Groundhog Day. Still, Phil probably doesn’t have to worry about these pretenders to the throne. It’s more likely Phil will be put out of business by climate change. The winter of 2012 was the fourth warmest on record in the United States (2000, 1999, and 1992 were first, second, and third, respectively). 2012 was actually the 36th consecutive year where global temperatures were above average. If this trend continues, Phil can perpetually pick early spring and retire. Or, if we insist on having a weather rodent, we can choose a tropical replacement. May I suggest the Asylum (PA) Agouti*? *Asylum, Pennsylvania, is a mere 200 miles from Punxsutawney. An agouti, besides being an excellent crossword puzzle word, is a rodent native to Central America, the West Indies, and northern South America. Punxsutawney and Groundhog Day History. Guardian (UK) Groundhog Day Data article. Actual Data spreadsheet from Guardian (UK). Agouti Fact Page from the San Diego Zoo.